1. DOC advocates charging for NZ Great Walks. On Oct 28, 2016 the DOC Director General Lou Sanson was reported by Radio NZ advocating charging people to walk our Great Walks. Then on Dec 12 a report commissioned from four major New Zealand's tourism leaders mooted the possibility of privatising the country's Great Walks. Press button below to see media items. This website is dedicated to the people of New Zealand retaining ownership and effective conservation management of our great outdoors. It is also dedicated to opposing any corrupt political actions that undermine these goals. The website was originally set up in 2013 after I left my career in the New Zealand Department of Conservation (DOC). I set up the site then in an attempt to make New Zealanders aware of the privatization process that I believed was happening to their national and forest parks that cover nearly a third of our nation. My belief now, which is supported by evidence on this site, is that DOC is an organisation crippled by corrupt political interference and inadequate funding. As a result, I think the organisation is no longer capable of effectively doing its job as the public service responsible for national conservation under law and according to the expectations of most New Zealanders. I think that when the current National government with their underlying neo-liberal ideology are ultimately removed from power there needs to be a thorough and transparent public review of the expectations, purpose and funding of DOC. The button below leads to a story with supporting evidence that, in my opinion, shows corruption in our nation at the highest level. The NZ Prime Minister's Agenda? Judge for Yourself. Press the button below to see the sequence of events leading to the commercialization of DOC. If you would like more insights also press the button "Understanding Neo-Liberal Ideology"
DOC had just adopted as its operating model: “A full-on commercial business approach run on the basis of supply and demand”. 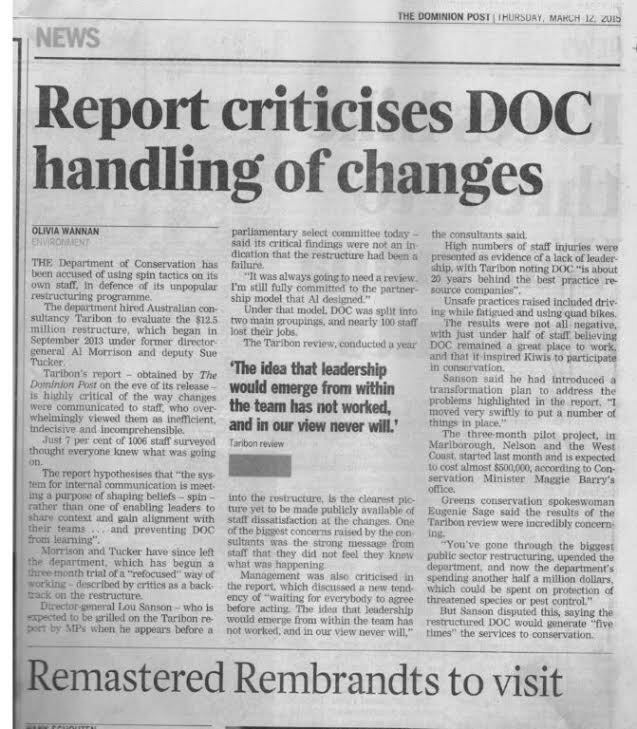 (Personally I found this bizarre considering DOC was a public service dealing with conservation). I have degrees in forestry and theology. Although I had previously earned good money working for some of the largest commercial forestry companies in the country I had come to adopt a career in DOC out of idealism. My departure from DOC was therefore an acrimonious "divorce" stemming from the fact that I personally, professionally and philosophically opposed the new direction of the organisation. Because of my opposition I believe a group of managers conspired to bully me and this resulted in a total breakdown of the working relationship. ​The most unfortunate thing in my opinion, is that most people still don’t “get it” that all the change processes in DOC were a smokescreen, a deception. In my view, the current outcome in DOC is not a failed exercise in saving costs nor a failed experiment in trying a new way to do conservation. I think the evidence indicates that the whole exercise was highly successful in undermining the legal and organisational infrastructure that limits private and overseas investment in conservation assets that would support growth in tourism. While to many people this may appear not to be a bad thing, I think the trajectory that needs to be considered is, who will ultimately control (“own”) those conservation assets in 20-30 years’ time? Who will end up owning the rights to our "Lord of the Rings" national parks, beautiful great walks, beaches, ski-fields, hunting and numerous other potential income earning attractions? Who will be able to afford to use these assets? Will it be NZ citizens or wealthy overseas investors and tourists? I personally have moved on to a new career and am enjoying life again. However, I am never going to forget what has happened at DOC (or how I and others were mistreated). It may take another 20 years for enough New Zealanders to realise what has been done and seek answers. Until then, it is a minimal cost for me to keep this website running and seek to improve it over time.